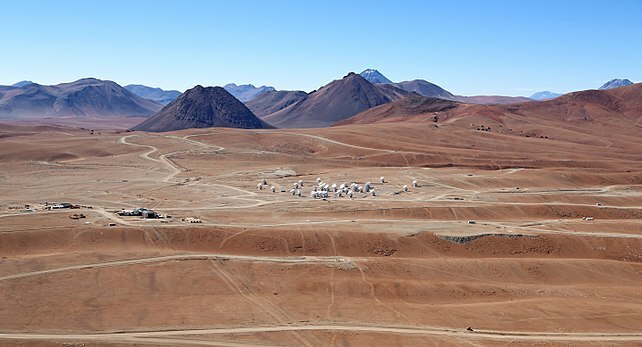 Observations using the ALMA interferometer show that winds in Titan's atmosphere do not fade with altitude; rather they reach 350 m/s at 1000 km above the surface. In April 2018, just a year ago, at the European Geophysical Union annual meeting in Vienna, there was a great topic of excitement with the latest astonishing results from the Juno and Cassini space missions regarding winds in the deep atmospheres of Jupiter and Saturn. Through the measurement of the fine structure of their gravity fields, it was revealed that winds in Jupiter and Saturn extend ~3000 and 9000 km, respectively, below the visible clouds. This solved a many decade-old question, with fundamental implications for the internal structure of these gas giants and the processes that generate their magnetic fields. It turned out that at that same conference I had a talk on Titan winds, presenting material that would ultimately make the paper presently published in Nature Astronomy. For Titan and its 1.5 bar N2 atmosphere, the question was not « how deep do winds extent ? », but rather « how high do winds extent in this ~1500 km thick atmosphere? » The wind structure in Titan’s lower and middle atmosphere is relatively well characterized. Back in 2005, the Huygens Probe had measured the speed and direction of winds from 150 km down to the surface during its descent across Titan’s atmosphere, and over 2004-2017, the Cassini Composite Infrared Spectrometer CIRS provided extensive fields of temperatures over ~100-500 km altitude, from which winds can also be deduced (under some assumptions). From (among other) the point of view of atmospheric dynamics, Titan is an interesting case. The moon rotates slowly on itself (16 Earth day period), but the atmosphere rotates (in a zonal way, ie parallel to the Equator) much more quickly. For example at 300 km, the winds can reach ~200 m/s in the same direction as the solid body, which corresponds to a rotation period around Titan's axis of about 1 Earth day. This situation – called atmospheric super-rotation – is also observed (in a more extreme way) in Venus. Modellers think that it is caused by the combined effect of a solar-driven meridional circulation, forming high-latitude jets, and propagating waves, transporting angular momentum equatorward. Titan is even more interesting than Venus, because in relation to its 27° obliquity it has seasons; hence the meridional circulation changes across Titan year. On Venus, we know that the upper atmosphere above 100 km (the thermosphere) is the place of another wind regime. There, winds blow mostly from the dayside to the nightside, in response to the daily variations of insolation, while zonal winds are also existing but more minor. On Titan, we had very limited information on the wind regime above ~300 km altitude. In the absence of in situ measurements and of wind tracers such as clouds, the only way to measure winds is from Doppler spectroscopy : molecular lines observed at high spectral resolution appear Doppler-shifted due to the projection of the local winds on the line-of-sight. At Titan the technique had been pioneered in the early 2000s at a variety of wavelengths (visible, thermal infrared, radio), but was limited to some relatively disparate results, and restricted to altitudes lower than ~450 km. Cassini also lacked the proper instrumentation to directly measure winds. Cassini could not do it, but ALMA did. Titan’s submm spectrum is the richest among all planetary atmospheres, and the relatively large apparent size of Titan (~1 arcsec, including the atmosphere) makes it possible to comfortably resolve the disk, isolate the limb emission, while keeping sufficient signal-to-noise to discern Doppler winds. We used ALMA in 2016 in this manner and obtained wind maps in Titan in no less that 6 different species : HCN, DCN, CH3CN, CH3CCH, HC3N and HNC. All the wind maps indicated strong (250-350 m/s) blueshifts on Titan’s east limb, and corresponding redshifts on the west limb, demonstrating a primarily zonal circulation, but with different detailed structure from molecule to molecule. For example, the two maps below refer to CH3CN and HNC. Look how wind fields at different. 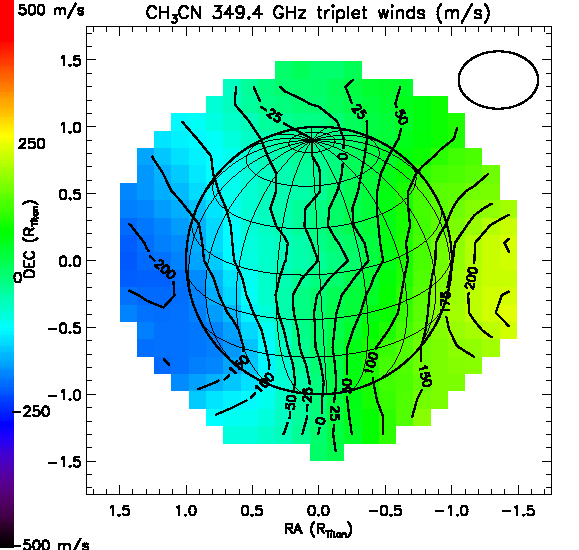 In CH3CN we see an hemispheric assymetry, with winds stronger in the south (winter) than in the north (summer). In HNC, we see mostly a very strong equatorial jet with speed of almost 350 m/s, i.e. 40 % higher than the speed of sound ! 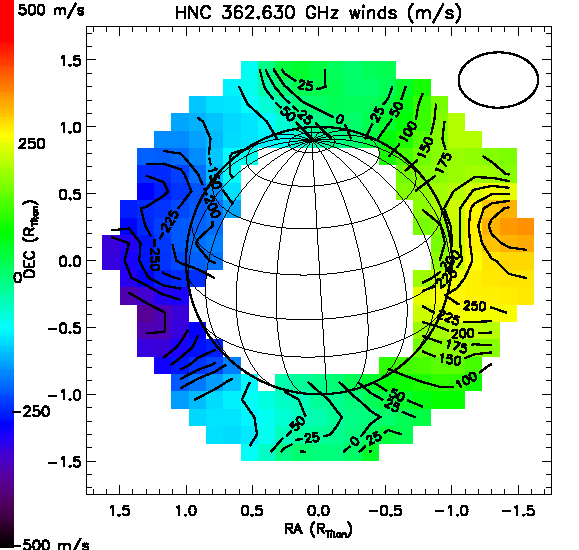 Wind maps in measured CH3CN (top) and HNC (bottom). Where do these strong winds occur in the atmosphere ? Modelling of the line shapes and intensities provides the molecule abundance profiles, which in turns permits to assign altitudes to the wind measurements. Remarkably each species provides its own altitude information, and altogether they sample the 350 km-1000 km range, the upper altitude (i.e. Titan’s thermosphere) range being probed by HNC. Rather nicely, their combination very consistently showed that wind speeds increase with increasing altitude (see Figure below), while at the same time, the wind regime progressively evolves from an hemispherically-assymetric regime at 350 km (already inferred from Cassini) to a newly discovered equatorial jet regime at 1000 km. 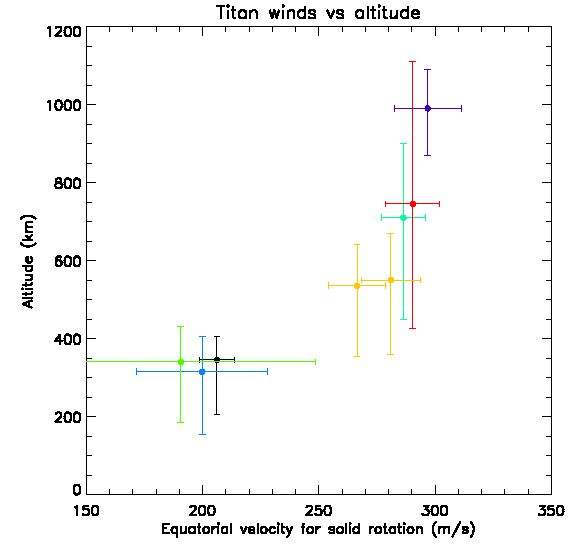 The equivalent equatorial wind velocity as a function of altitude in Titan's atmosphere. The existence of 350 m/s zonal equatorial winds in Titan’s thermosphere was totally unexpected based on density measurements from Cassini, and its physical origin remains to elucidate. Unlike in the stratosphere, solar energy is probably not the culprit: in that case, day-to-night winds should have been observed (as in the case for example in Venus’ thermosphere). Energy sources due to particle sources (ions, electrons), which are weaker than solar input at Titan, might not seem promising as well, but a possibility would be that the magnetospheric plasma that hits Titan at 120 km/s drives convection in the ionosphere, perhaps ultimately generating winds in the neutral upper atmosphere. However, these magnetospheric winds are unlikely to penetrate the atmosphere below 1000 km, while the above Figure shows that strong winds are observed throughout the 350 km-1000 km range. Perhaps more likely, a source « from below » is to be envisaged, whereby gravity waves produced (and observed) at stratospheric levels propagate upwards, deposit momentum, and accelerate equatorial winds. Additional observations to characterize possible wind variability, and theoretical investigations to assess the quantitative plausibility of these mechanisms are urgently needed. But for now, these ALMA results demonstrate that, even in the era of extensive space-borne Solar System exploration, ground-based observations of « well-known » planets and their satellites still have a voice.